Ring In the New Year Italian-Style! Mystery Pic: Whose Bowl Is It Anyway? When it comes to meeting up with a friend for lunch, those of us on the east side of the river have endless choices in a panoply of cuisines, from American barbecue to Mexican tacos to African stews to Cuban sandwiches. And you can pretty much name your price point, from cheap to très cher. Downtown is another story altogether—in numbers, variety and cost—if you want to sit at an inside table in a heated room, and the past few weeks have been so unseasonably cold that those were pretty much required attributes. 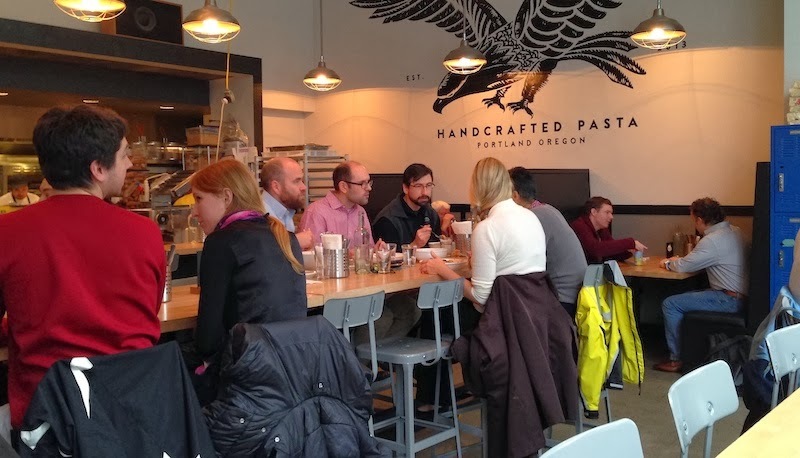 So when a friend who works at PSU wanted to meet during her limited lunch hour, I suggested Grassa, Rick Gencarelli's pasta emporium on the upper side of downtown, an area recently bestowed with the tony-sounding title "West End." Walking in, some neck-craning is required to read the ceiling-to-floor blackboard menu before you step up to the register to place your order. Then you're given a number and directed to the long, shared counter-height tables and stools or the bar facing the kitchen. We opted for two plates of the house-made pasta, and within 15 minutes they were placed before us. 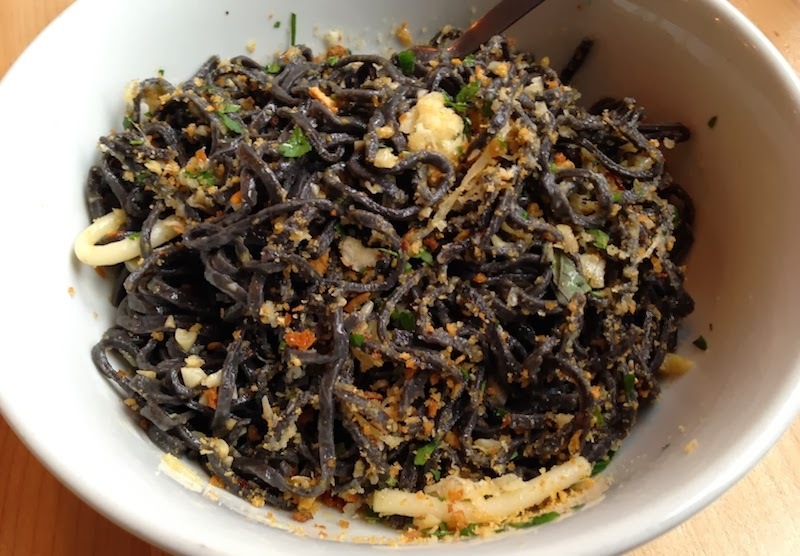 My squid ink pasta "Aglia Olio" was a basic pangratatto, the pasta beautifully black and tossed with olive oil, garlic, chiles, romano and crunchy toasted breadcrumbs. My companion's "Gigli"—lamb bolognese, pecorino and a sprinkling of fried mint—broke the comfort-o-meter with its warm, luscious combination of pasta and fatty meat sauce. At eight and eleven dollars, respectively, these were well worth the price, and we could have split a salad for not much more. Plus we were finished in time for a leisurely cappucino at Heart a half-block away. Details: Grassa, 1205 SW Washington St. 503-241-1133. The day after my friend Hank Shaw's incredible booksigning/dinner at St. Jack where chef Aaron Barnett blew the roof off the building with his ducky prowess, we decided to take it easy and have a restorative lunch at what I consider the finest pho palace in PDX, Ha & VL. This postage stamp of a place has been known to run out of soup late in the morning, so I was somewhat nervous walking in a little closer to noon than I like. 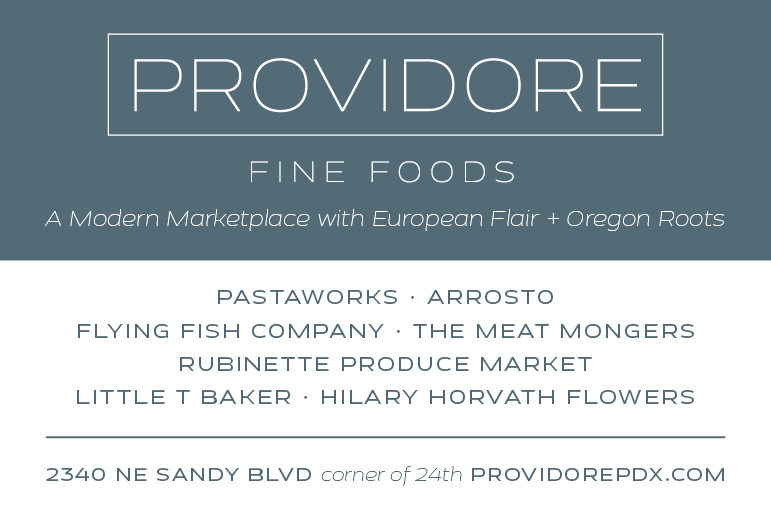 Plus Hank's home town of Sacramento has some of the best Asian restaurants of anyplace in California, which cannot, sadly, be said of Portland. 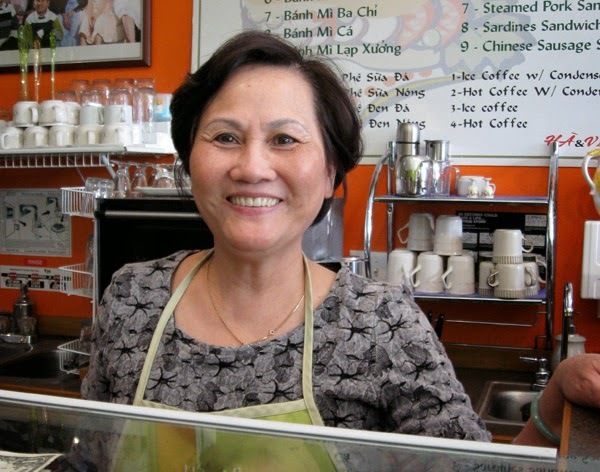 Ha Luu, maestress of pho. I needn't have worried on either count. Since proprietor Ha Luu has started making two soups a day rather than just one, we were able to get a bowl of each. 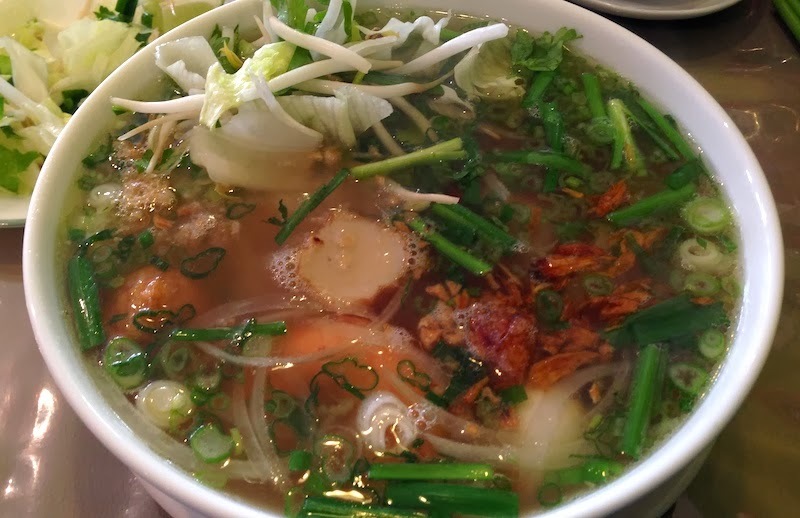 Mine was the Phnom Penh special, a perfectly balanced bowl of broth, noodle and bits of pork and seafood that makes me crave Luu's soups on a regular basis. Hank's pho ga (chicken soup for you non-pho speakers) was equally amazing, and he proclaimed that the pho here was as good as any he could get in his home town. Details: Ha & VL, 2738 SE 82nd Ave., #102. 503-772-0103. The Stone Cliff Inn is one of those places that takes you by surprise. First off, it's a giant Doug fir-timbered lodge set high on a cliff overlooking the Clackamas River outside of Carver. It was built by the son of a local logging family, the Rosenbaums, on the site of a rock quarry, the rock from which was used to line the steep driveway and which forms the foundation of the lodge. 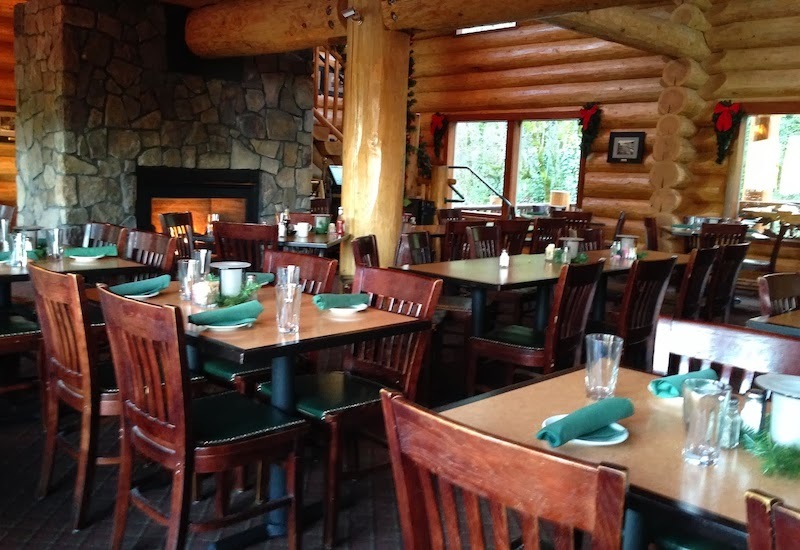 Inside you can sit in the vaulted dining room in front of the giant stone fireplace (left) or at one of the many windowed tables with a spectacular view of the river. 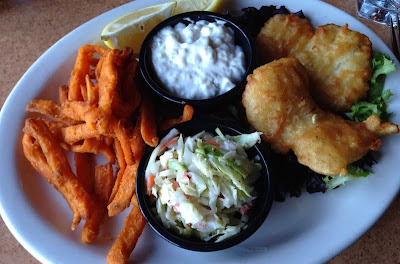 The lunch menu features a decent middle-of-the-road selection of salads and sandwiches, but on it is also a very good and plate of fish and chips with a hefty helping of fish, a decent cole slaw and some of the best sweet potato fries I've had in town. If you're looking for a destination after a weekend drive in the country, this would be a fun place to go, or to take your Aunt Tilly for a nice lunch and a glass of wine. I'm interested in heading back when the deck is open and I can sit looking out on that great view with a cold beer to go along with those sweet potato fries. Details: Stone Cliff Inn, 17900 S. Clackamas River Dr., Oregon City. 503-631-7900.